I have a confession, I'm hopelessly addicted to SimCity BuildIt on the iPad. I've put in more hours than I care to admit on the game. It walks that fine line between the Free To Play Model and just a good ol' fashioned game of SimCity. The latest update for the game has added a cooperative feature that I hope is the basis for more to come. 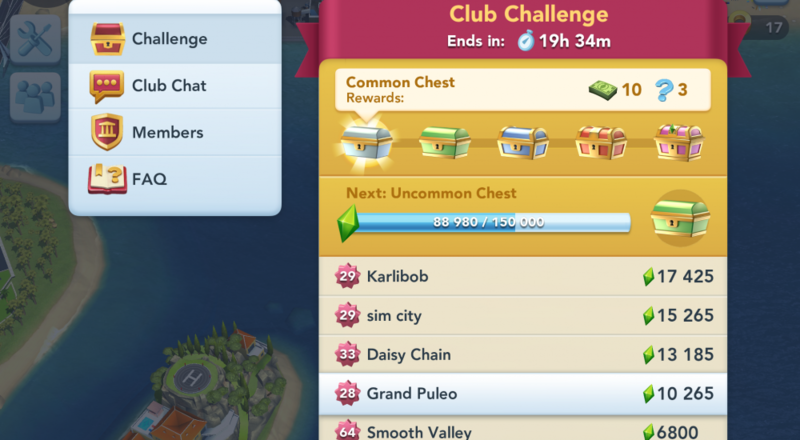 Called Club Challenges, the game allows your 20 city Mayor's Club to work together to unlock chests of items for the game. The higher your cumulative score, the better and more rare of a chest you'll earn. These reset every week, so you'll always have a chance for more goodies. Next on my wishlist - the ability to have a private club trading section. Our Co-Optimus club is constantly looking to trade items between players, but the inability to lock down sales from the public makes this incredibly challenging. SimCity BuildIt is available on iOS and Android. Page created in 0.9099 seconds.